Well done to first year Home Economics students who up-cycled an old jumper to create a themed Christmas Jumper. This was part of their sustainable textile module they completed during class. Up-Cycled Christmas Jumpers 1st Year Home Ec_Medium (1) from Ballinamore Community School on Vimeo. Well done to 2nd yr home economics students who put great time and effort into creating their dream bedrooms in a shoebox. This was part of their study on interior design and was also part of their Christmas assessment. The Bin It Workshop visited our school recently and all first yrs participated in the workshop. It was informative and entertaining as students learned more about the environmental impact of littering and the effects of not disposing chewing gum properly. This links in with our current green school flag (Global Citizenship: Litter & Waste) we are working towards. Thank you to Oscar and Jemina (our Spanish students) who showed their Home Economics class how to make Tortilla a popular lunch or pinxtos option in Spain. Everyone enjoyed tasting the dish. 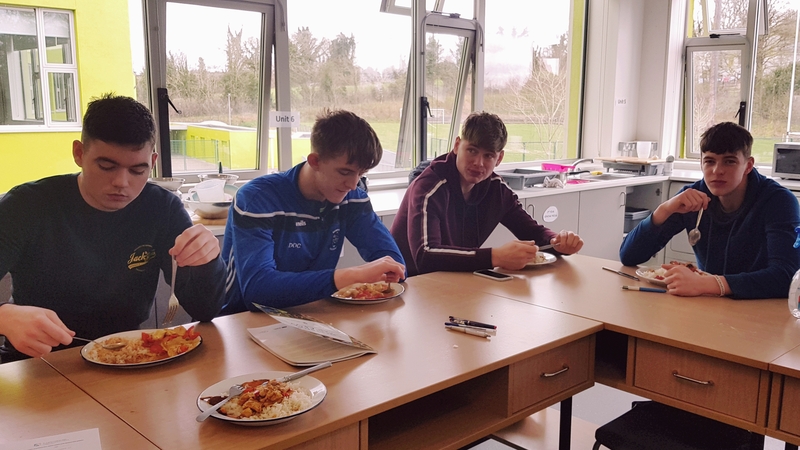 Thank you to Ciara McTeigue (on behalf of AIB) who gave an informative talk to the 6th year Home Economics class on all things finance including information on savings accounts, importance of budgeting, having good credit history and conditions required for mortgage applications. Not only is this topic on their exam in June but it is applicable to everyday life.